We can ID this grebe as a New Zealand Dabchick by its glossy black head; black, short, pointed bill; dark plumage; short, tufted white tail (this is very distinctive when looking at rear of bird) and bright eyes (in this lighting eyes look white, but are actually yellow). The New Zealand Dabchick is a member of the grebe family and is endemic to New Zealand. 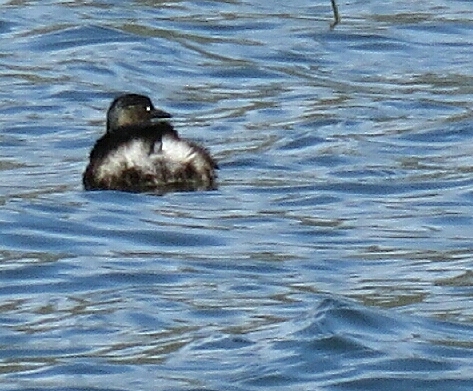 The New Zealand Dabchick is a new species to our Photographic Life List, which now stands at 737.